make a nice groovy layout. This tree really doesn't want to just be a flat tree like /pics2. 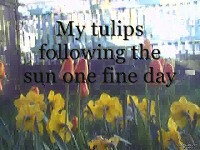 This is extracted from the window cam at my new house, watching the tulips and daffodils out the window open and close over the course of fine May day in Reykjavik. It was chopped up a bit with windows movie maker, so it's probably bigger than it needs to be. My first outside highres timelapse. This was an exercise in suffering for my art, standing outside in freezing cold and driving wind for half an hour at 3am, collecting the frames that would go into this. I'm pretty happy with how it turned out. This is one frame every 30 seconds, over 30 minutes to get a massive 6 seconds of video. If I was doing it again, I'd do one every 15 seconds. The useful bits there are setting the frame rate to 10fps, and msmpeg4v2, so it plays everywhere, or at least, in more places. broken and changeable 4cc codes are annoying, and not something that anyone should have to deal with. Basically the same as at Hlölli, above, only not as interesting. Sólon was actually closed that afternoon, but I'd actually already started before I noticed :) This series is also one frame every 12-13 seconds or so, basicaly, the self timer interval, repeatedly. It certainly makes the video smoother. I've wanted to go and do one at Sólon at night, when there's more madness going on, but it would also put me and my tripod on a very busy intersection, dealing with a lot of very drunk people. It hasn't happened yet. I really want to get night scenes from the queues at all the bars I can, but it's awkward to get good ones without everyone noticing. Speaking of timelapse, I also make a daily timelapse movie with the webcam pointed out my bedroom window across the harbour to Esja. It gets its own page.